Can you believe that Thanksgiving will be here in less than 2 weeks!? I do not know about you but I wish I could slow things down a bit. This is my favorite time of year but everything is always so rushed and over before we know it. 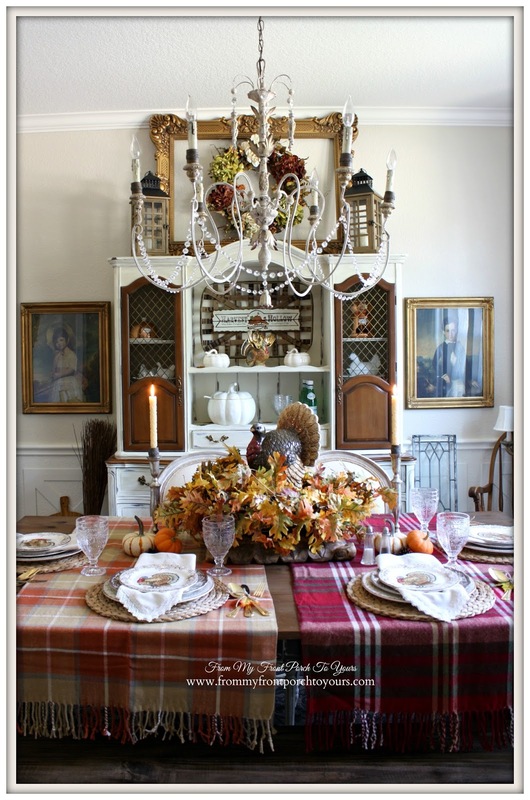 This is my first year doing a Thanksgiving dining room. 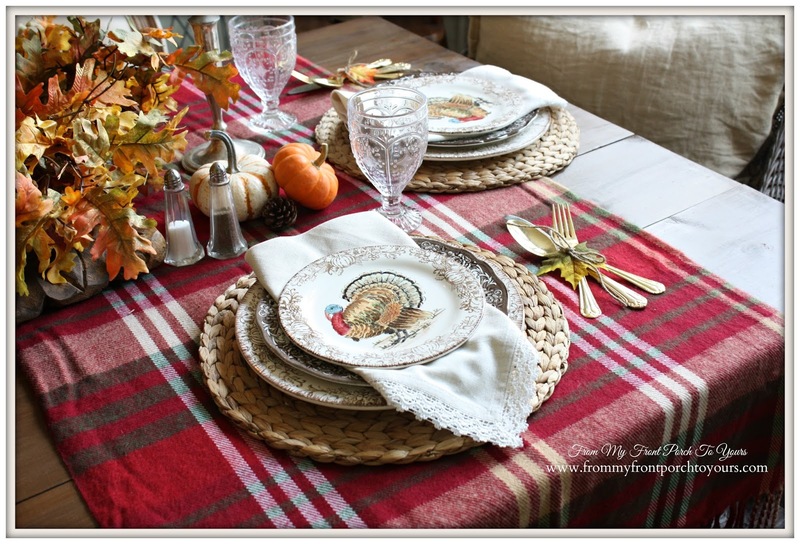 I normally just do fall and call it a day but I found some turkey dinnerware that I fell in love with and it inspired me. I found Tom The Turkey at Home Depot of all places. 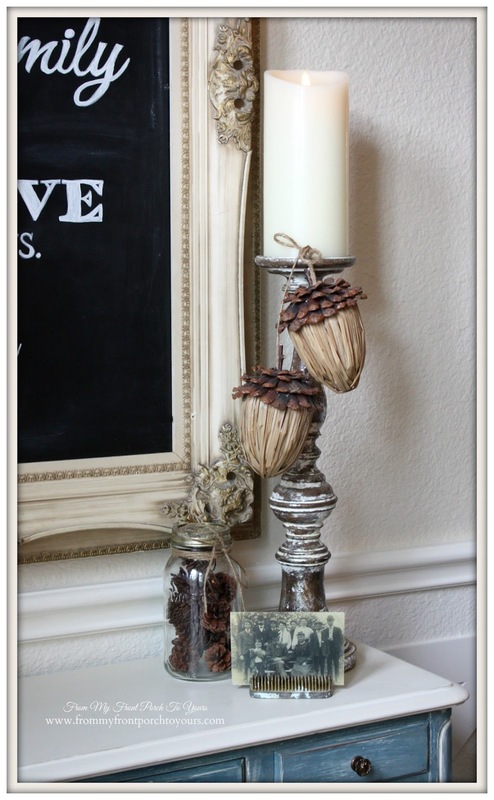 The rest of the centerpiece is made from a wood pedestal and the beautiful leaf wreath I used for our fall mantel. Here is the turkey dinnerware. 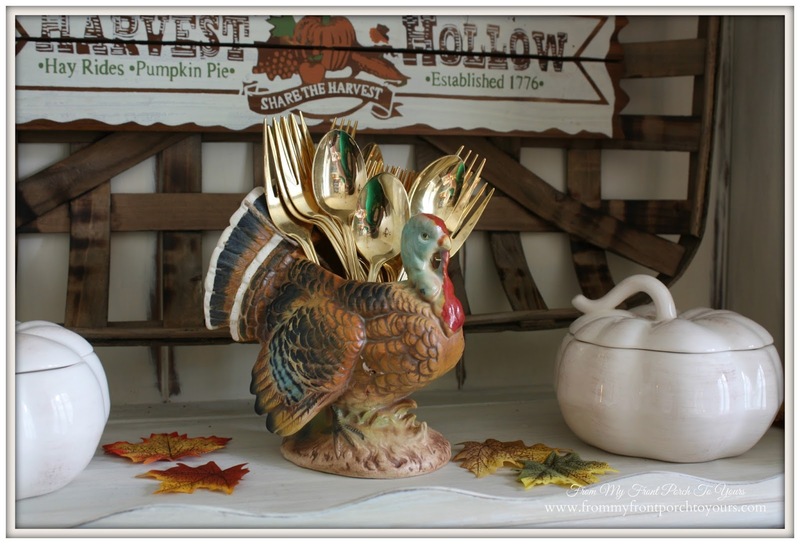 I fell in love with it immediately because I knew it would go nicely with my brown transferware and I loved the coloring of the turkey. Little vintage turkey I found at an antique shop. I thought about coming up with new chalkboard art for Thanksgiving but then I decided that I loved this artwork so much that I just re created it. I thought it was perfect for Thanksgiving. Miss Savannah says thank you for stopping by to visit and she hopes that you all have a wonderful Thanksgiving with family and friends! 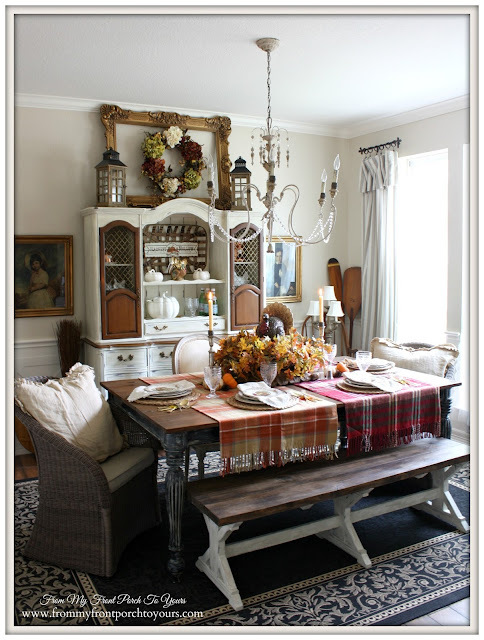 I love every single thing about this room and tablescape, Pamela. 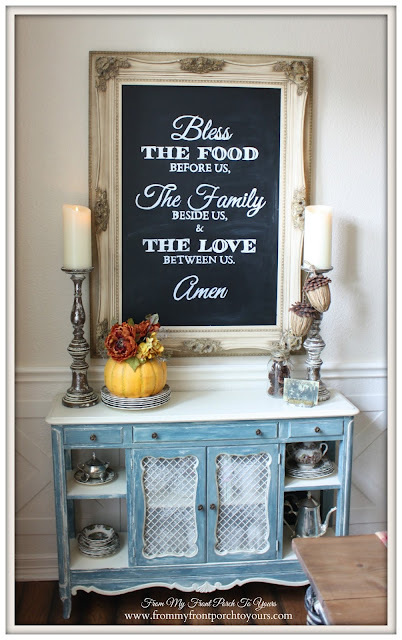 From the utensils to the dishes to the plaid wool throws as runners to the verse on the chalkboard, and that wonderfully raised centerpiece - it's all good. No, it's great! l love everything about your DR, Pamela. 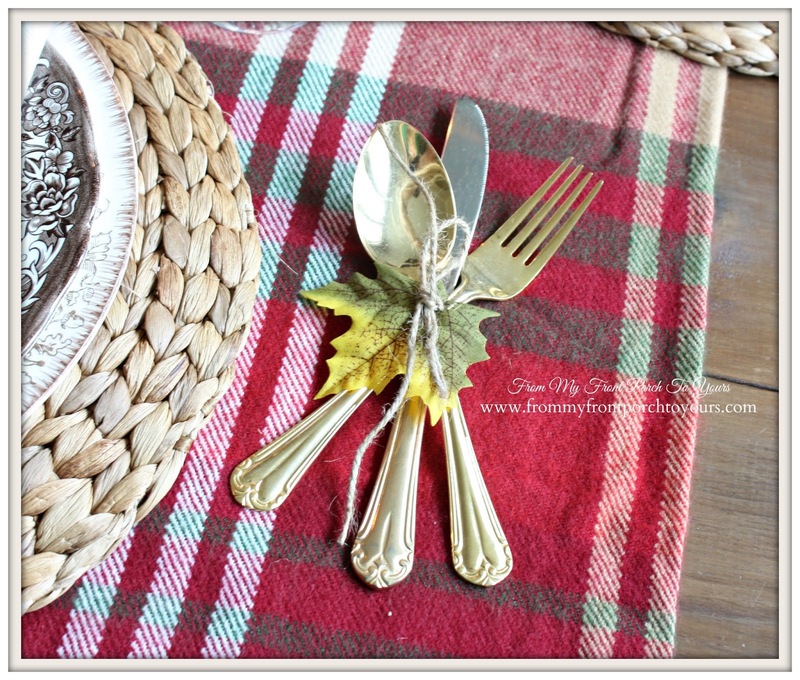 the tartan plaid, the turkey centerpiece with leaves. It's all just wonderful!! Your dining room is so beautiful and I love your pretty new Turkey and dishes. Gorgeous setting. 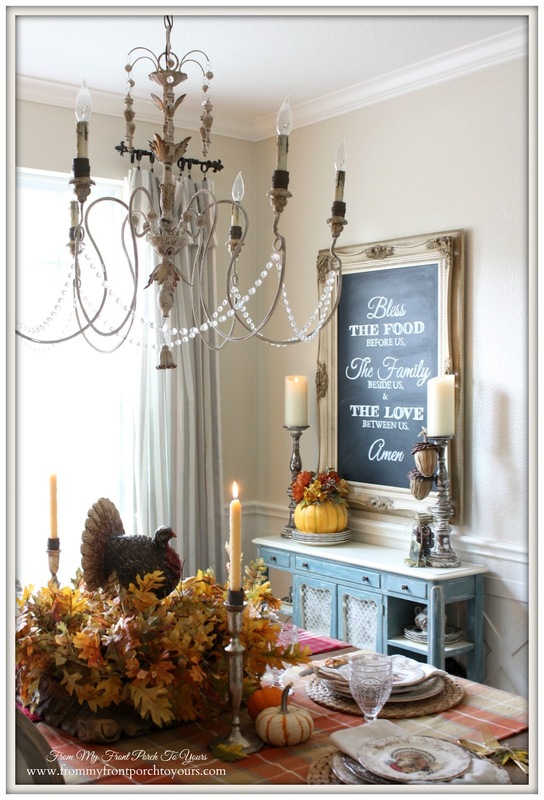 love the browns, rust, and pop of blue in the turkey dishes. Really admire how you put it all together. 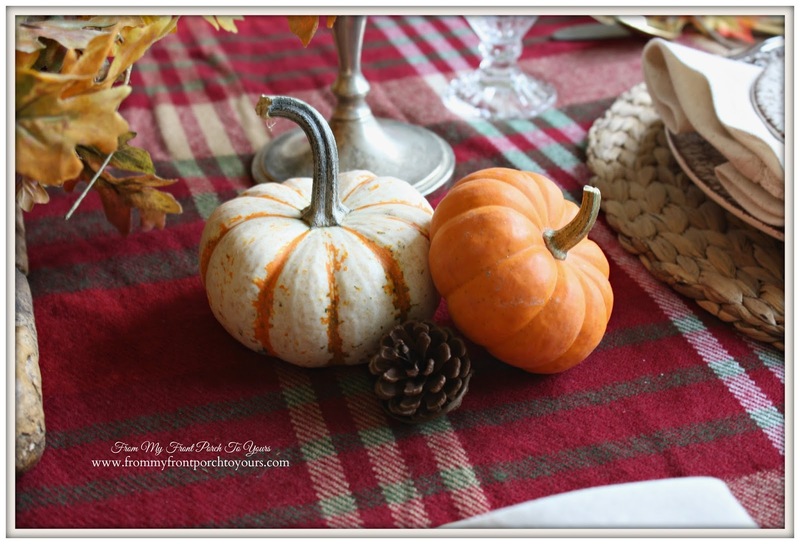 Your Thanksgiving table is pretty! 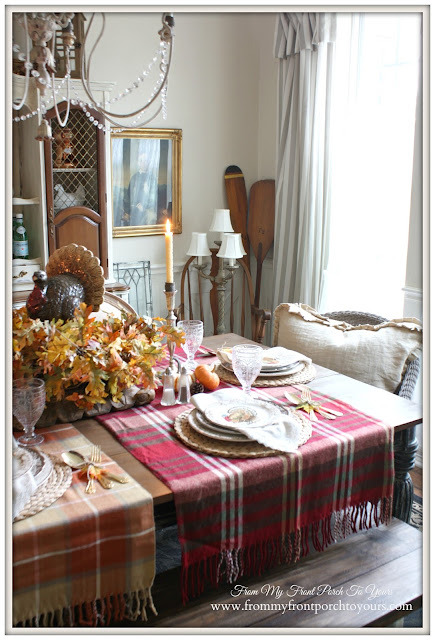 I like the tartan on the table! Pamela, your dining room is always stunning! Now this is my idea of a Thanksgiving table! I adore all the plaid. I can't wait to see what you do for the Texas blog hop. Hope you are enjoying a cozy Monday. 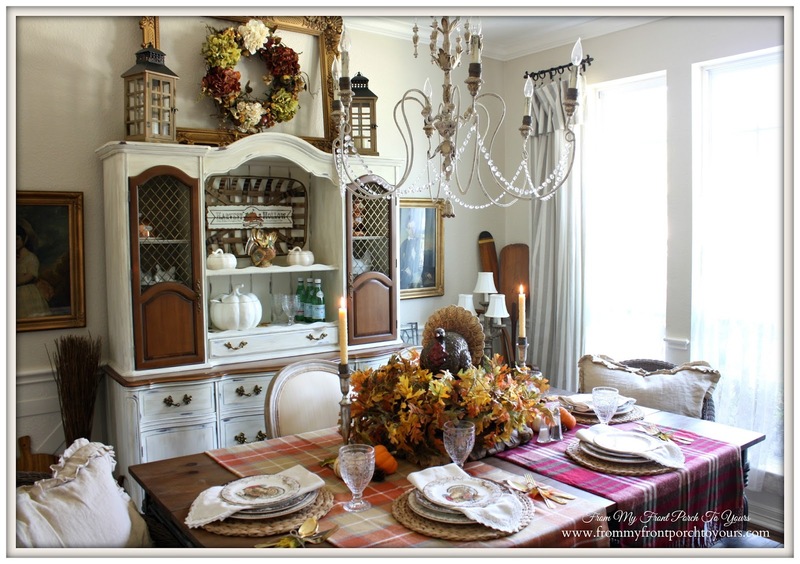 Love your pretty table for Thanksgiving Pamela. So beautiful. Love that centerpiece. Looks so cozy and inviting to sit and have your wonderful meal. Fantastically fabulous as always Pamela! Love the leaf accents all around! So pretty, everything looks perfect. I love your chalkboard saying. 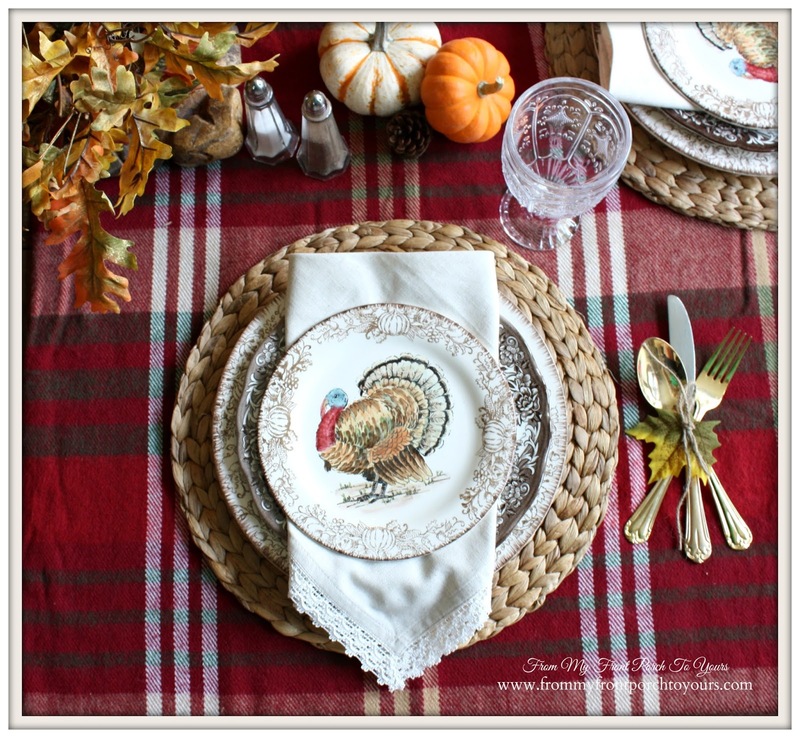 Great Turkey plates to coordinate with your brown transfer ware, dear one!!! Love the use of Tartan Plaid Throws on your dining room table!!! Amazing idea using the leaf wreath to surround the Tom Turkey in your centerpiece!!! Thanks for sharing and blessings to you and your family at Thanksgiving and all year through!!! Love this room all decked out for Thanksgiving Day! Beautiful!! Thanks so much for stopping by!! I love every bit of it, Pamela. You included so many wonderful touches - adorable dinnerware, turkeys, and pretty plaid table covers. Beautiful! So happy to have found you via Wow us Wednesday! Everything here is absolutely beautiful, you are very creative! 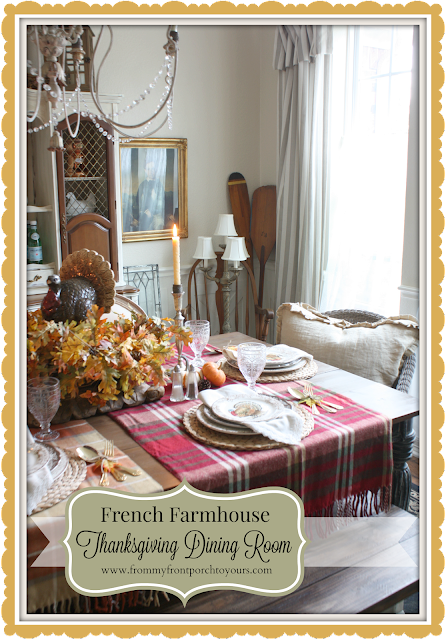 There is so much to love ... so much character and will serve as the perfect backdrop for your Thanksgiving! I love how you used two different throws as runners ... really like the place settings ... and the chalkboard is perfect. So inviting! 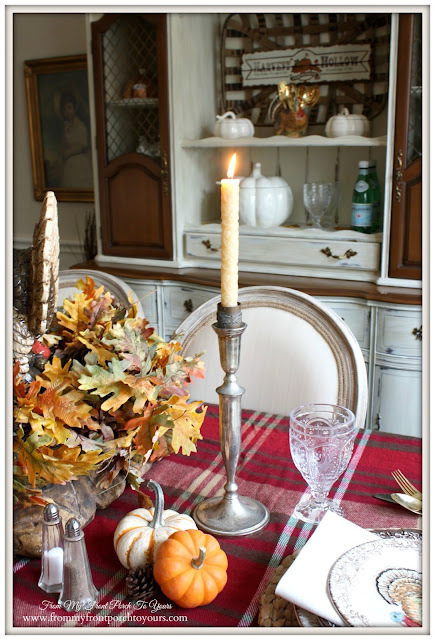 Beautiful table setting Pamela! 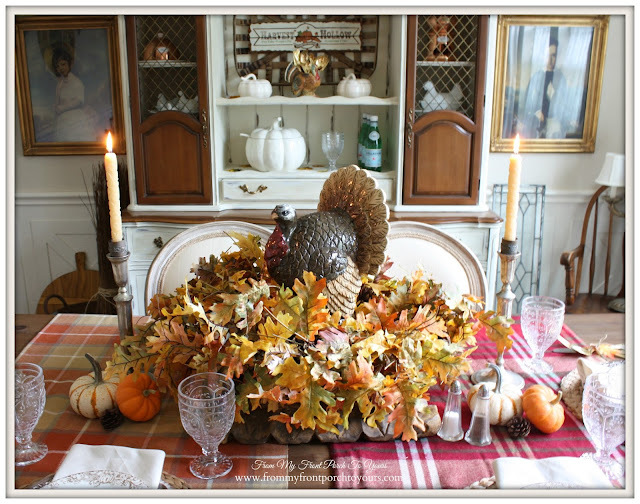 Love how you did the centerpiece and the turkey dinnerware is awesome. Gorgeous Pamela and little Savannah is adorable! Pamela I love your decor. It's so warm and cozy. I especially love the chalkboard art. Is that print available somewhere that I could purchase it? Thank you. 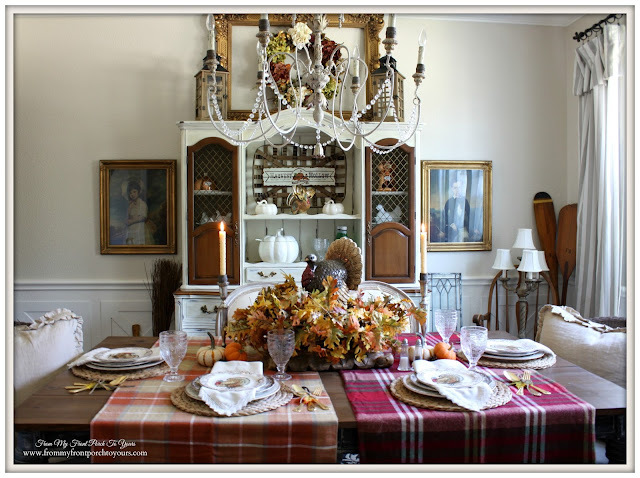 Very pretty and original...the plaid and then elegant dishes are perfect. i am in love with your cabinet. Your table is just perfect...don't change a thing this year) although that's hard!). 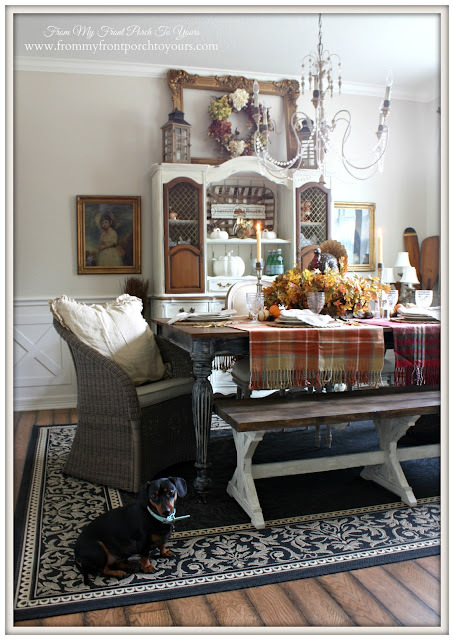 I remember your beautiful table Pamela!....Can't wait to see the progress you are making in your new home! How exciting!!! Happy November!